When I was growing up in Colombia, my mom made sudados once a week. 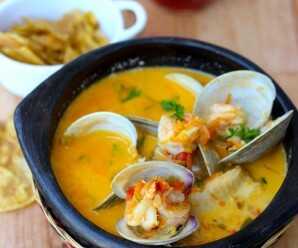 Sudados are a popular dish in Colombia and we have many variations of this dish. For my mom, sudado is the perfect one pot, quick and simple meal. She would make a big pot so we would have left overs for the next day and served it over white rice and fried pantains with avocado on the side. The aromas of this dish remind me of home whenever I cook it. I hope you enjoy it as much as I do. 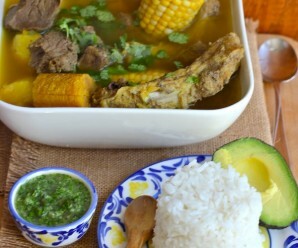 This is traditional Colombian home cooking, the style of food that my mom knows how to make very well. Some other variations of sudados are: chicken, beef, pork, meatballs and fish. In a large pot, heat the vegetable oil over medium heat. Add the onion and scallions and sauté until onions are translucent, about 3 minutes. Then add the tomatoes, garlic, salt and ground pepper and sauté for 5 more minutes. Add water, yuca and cumin powder. Reduce the heat to medium low, cover, and cook for 10 minutes, stirring occasionally. 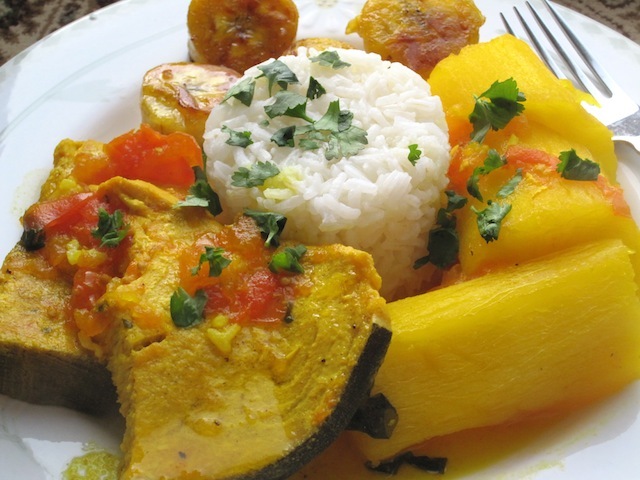 Add Fish steaks and cilantro and cook for an additional 15 minutes or until the fish is cooked and the yuca is tender. 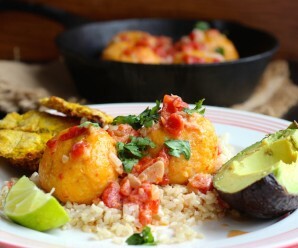 Serve with white rice and fried sweet plantains on the side. Too bad I didn’t see this post earlier today, I made some fish for lunch (I’m on vacation from school), it was good, but this would have been so much better! Mmm… I need to get some swordfish and make this, my family would love this stew! I have to make this. My mouth is watering for it!! yes, please! I would order this anywhere it was possible to get right now! This looks delish – and I’m totally loving the colors on this plate! I avocado is the perfect accompaniment to fish, root vegetables and rice…and I love a squeeze of lime all over it. What a treat this would be, I would love to have grown up eating this once a week! I always love your plating! Beautiful. Sounds really yummy. Erica, you are never going to believe this. I made a dish almost exactly like this yesterday! Yours looks great especially with the side of rice, I like that!! 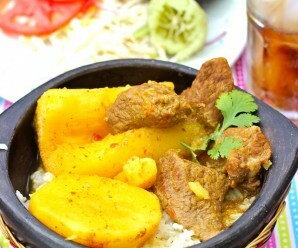 that’s an excellent one pot dish, rich in colour and flavors, appealing and delicious!!! That dish looks absolutely amazing. I hope to find some free time to try it. Its a perfect Friday dish for Lent. Oh, I haven’t had swordfish in years. This looks delicious! I just bought some of the Sazon with azafran and I am glad to see how you used it in one of your recipes. It looks colorful and gorgeous. I love real down-to-earth homestyle meals like this. Looks fantastic…so full of flavor. Especially over some fried plantains (swoon). Perfect Lenten dish, Erica! And beautifully presented too! I do adore plantains and could actually eat those for dinner and nothing else! I made this dish today and it was delicious!!! I used Talapia and potatoes instead of the sword fish and yuca and it came out just right….sooo yummy! !…My family loved it. Thanks…. Your recipes are great! I love your website! My dad is interesting in using your recipes but he doesn’t speak English . Do you have a website with the recipes in Spanish?